Hip replacement surgeries are performed to increase mobility and reduce pain in patients who have damaged hip joints. Once a person receives a new, more functional joint, they ideally experience a reduced amount of pain. This is not always the case though, for thousands of people who received metal hip replacements that malfunctioned early, and had to be replaced through revision surgery. Oftentimes, the revision surgery may require significantly more time for recovery, and may be more invasive than the original procedure. According to court documents, lawsuits filed over the DePuy ASR Hip Replacement System, which was recalled in 2010, similarly allege that its metal-on-metal design may increase a recipient’s susceptibility to injuries related to premature device failure. Metal debris may break off the implant and shed into the bloodstream, claimants allege, and cause chronic pain, premature device failure and symptoms associated with metallosis (metal ion poisoning). ’s 510(k) approval process, which allows a product to bypass human testing if a manufacturer can prove it to be equivalent to one already on the market. Implant loosening and metallosis are some of the complications alleged in lawsuits over the Rejuvenate and ABG II hip stems, which have been consolidated in U.S. federal and state litigations. Biomet Inc., a British manufacturer of hip replacements, is preparing to defend thousands of cases over its M2A Magnum hip implant. In February 2014, the U.S. District Court, Northern District of Indiana approved a proposed Biomet hip settlement for cases filed over the devices, which could resolve hundreds of lawsuits alleging pseudotumor formation, chronic pain, metallosis and other complications stemming from the metal hips. If approved, patients who had their Biomet M2a Magnum hip replaced after 180 days of receiving it would receive a base award of $200,000. 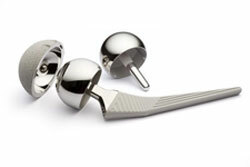 These hip devices are similar to those recalled by DePuy in their metal-on-metal construction, and are subject to investigation into whether they cause similar patient side effects to those stemming from the ASR hip, and an all-metal version of the Pinnacle that incorporates an Ultamet liner. Dozens of lawsuits over the Wright Conserve hip have been consolidated in a federal multidistrict litigation established in the U.S. District Court, Northern District of Georgia.